The reason I came to Collegium is for a specific purpose, one that could potentially help my university. So it is interesting that what I have gotten out of it so far has been more relevant to a research project that has been in the back of my mind for years. At my university, I have been helping to develop a sense of how to approach online and blended learning for our students, as well as to help faculty develop their online and blended courses. One of the issues that we have discussed in this process has been the extent to which we are able to translate the research-centered teaching we have been honing on campus from the face-to-face learning environment to the online environment. Part of this is to be able to maintain a quality of our institution’s educational experience that makes us distinct in the area. Another part of this is to be able to maintain a commitment to a Dominican and Catholic approach to higher education. As part of this process, I was awarded a fellowship to further investigate how to translate the Catholic ethos of higher education to an online learning community. Since I am not Catholic, I was invited to attend Collegium in order to more fully understand just what this Catholic ethos is. The hope is that by experiencing more of this mission and identity, I would better understand and even develop ideas as to how to structure online learning to reflect this ethos. While there are numerous Catholic universities that offer online programs and courses, this focus on translating the ethos does not seem to have been as considered; thus, my greater knowledge of the ethos and how to do this could benefit more than just my university. However, for the first couple days, I have not gotten a clear answer or picture as to what this ethos is. Now, to be fair, I should not really expect to have “the answer” after only a couple days of somewhat devoted attention to this question. I am no genius, nothing special, and should not expect for this process to be easy. At the same time, part of the lack of an answer may be due to how much confusion there is in Catholic higher education as to what they all mean by mission, identity, and ethos in the beginning of the 21st century. Much of our discussion has focused on trying to answer this question, and thus far we do not have any concrete answer and, consequently, we do not have any method or direction for how to proceed. There is only the question: what is the identity and mission of a Catholic university in our current world? With that being said, I do believe I am picking up on things here and there. From the readings, the lectures, and the discussions, I am starting to get tidbits of what it means to be a Catholic university and to promote a Catholic approach to intellectual and personal development. As these thoughts strike me, I have been tweeting them. Partly to keep record of them, and partly to see if anyone out there would be able to comment back on them. 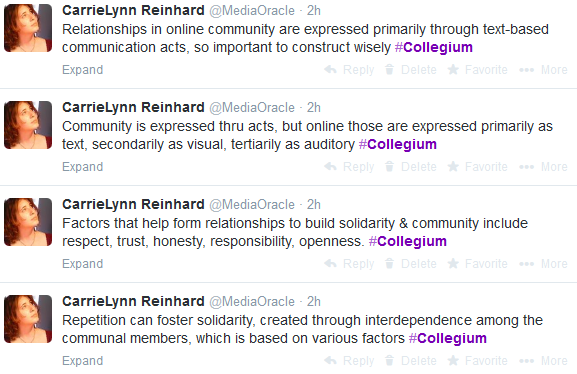 The following images constitute the totality of the tweets to date, all collected using the hashtag #Collegium. The tweets more or less follow the chronology of how they occurred — with the first occurring higher up in the images. Overall, I think I am grasping what it means to be a Catholic intellectual, and even what it means to be a Catholic in the modern world. 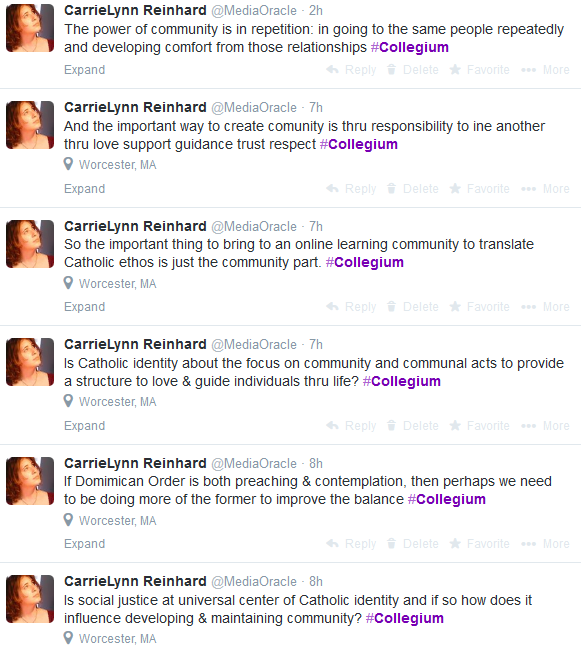 The importance of community is striking, and I think this experience at Collegium is giving me a better idea as to what is the Catholic approach to community that could help me better conceive what it would be like online then to be in a Catholic community. 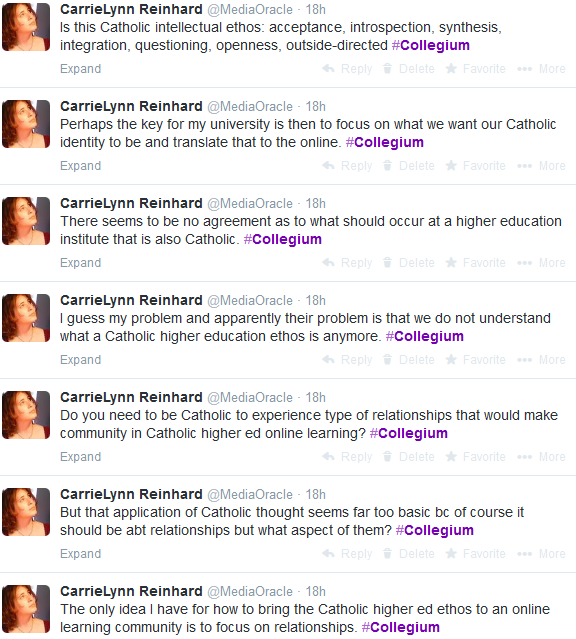 I am not certain I have a holistic or even complete image of what is the connection between community and education in a Catholic context; distance from Collegium and rumination over the pieces will most likely me necessary to assemble something more cohesive. I definitely do not know how to move forward in producing such an online learning community to reflect mission, identity, and ethos, but I also do not think I should be trying to force such procedural outcomes at this time. I think it would be enough to come away from this week with a better idea as to what is meant by that mission, identity, and ethos trinity, and to have that basic beholding accompanied by ideas as to what to do next — what directions to take in learning more. Such as who to talk to, what research to read, what online communities to observe, etc. So no answers, just questions, which is simultaneously frustrating and relieving. I would hate to come out of Collegium with a plan for the creation of an online learning community that completely fails right out of the gate because not enough consideration was put into its construction. Interestingly, while I continue to be hesitant to reach any conclusions about this online learning community project, these past couple days have helped me feel more secure in making conclusions about a project I have been considering for quite some time. For awhile now, I have wanted to do a project considering the overlaps, the similarities, in the psychology of fandom and religion. I have sometimes referred to this as considering how Christians are “fans of Jesus” in the way Trekkies are fans of Star Trek. I even tentatively began that discussion on this blog by considering how various religious figures could be read as superheroes. But Day 1 and Day 2 of Collegium has helped me think on this convergence of the two seemingly completely different cultural phenomena. And I have even gotten some validation for this idea from the religious individuals attending this colloquium. One of the reasons I never pursued this topic before was my concern about seeming to be disrespectful to these religions by, in some way, equating them with a phenomenon many might consider to be ephemeral, lowly, and corrupting. Indeed, I was worried about being labeled as blasphemer, even though I am an atheist. I never want to offend people, but instead want to get them to consider the possibility. Knowing that there are those out there, like the ones I meet here who find the idea interesting and with potential, helps me feel more secure in wanting to move forward with this project. So I have decided to write up an essay on the convergence of fandom and religion and submit it to next year’s CSCA conference. It would just be a theoretical essay, a thesis piece making the argument for the consideration of the convergence. But it could set the foundation for more research, empirical studies to explore the possibilities of the convergence. And this excites me, very much. Anything that excites you is well worth doing. As a fellow autoethnographer who is also developing a program to use it in the classroom, I applaud you sharing your work here…Very exciting to read. Thanks, Clare. This is my first attempt doing this. Am I getting anywhere close to the method/ology here?